ARS Sport is manufacturer of Artificial Grass Production that using globally famous proven quality raw materials for Rugby grass, artificial turf, Football Grass, Hockey Grass, Athletics Tracks,Running Tracks Sandwich System, Sandwich System Athletic Field & Artificial Grass, Tartan for Football and more. 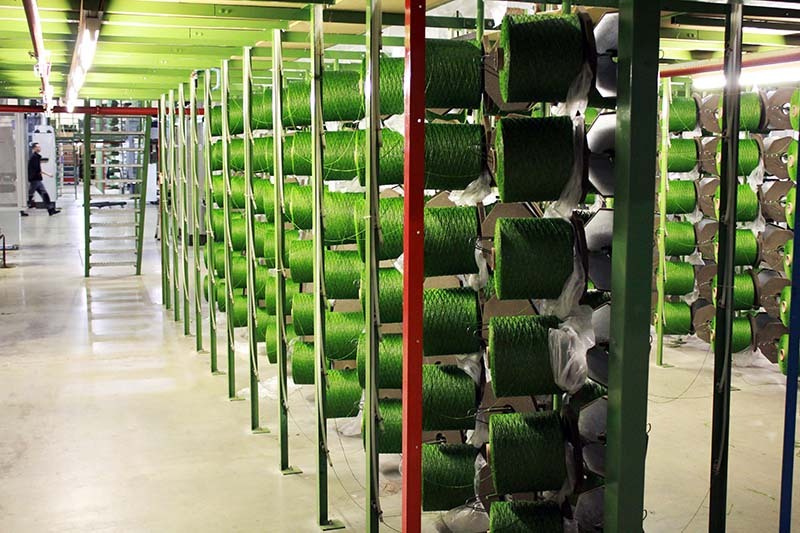 All of our raw materials meet the high international standards of Synthetic Turf Production systems. The PP, PE, PA yarns used as raw materials are UV resistant, durable and flexible. Latex and backing clothes used in production of bottom layer of artificial grass are environmentally friendly. Our skilled and well-educated production team uses the cutting edge-technology machines. Our Artificial Grass prices varies based on pile height, type of fiber and backing cloth. We have two types of fibers for artificial grass such as fibrillated and Mono filament fiber. Our Artificial Turfs designed Hockey Turf, Golf Turf, Football Turf for professional Grass for Football, Grass for Hokey, Grass for Tennis, Multi Sport, Golf pitches and for decorative and Landscaping purposes gained great appreciation from our customers due to their game performance and attractive natural view. All our products with long-lasting capabilities are applicable in extremely hot or cold weather conditions. · Finished appearance: Besides the play ability of the tennis court, the aesthetic aspect is even vital. Tennis surface acrylic to Lawn or Grass for tennis has even, non-glare, and smooth planes that would definitely catch anybody’s attention. · Vibrant: You can easily play with the colors in accordance with your preference and taste. The great part is that the colors instilled in your court are also fade-resistant hence you don’t need to worry about repainting. · Durability: Unquestionably, the acrylic playing surface is resilient and can also last for many years. Well, these courts are made up of sturdy and strong fibers that would survive despite unpredictable weather condition and brisk activities. There are several companies available in the market that provide lawn for tennis enthusiasts with ITF Approved Acrylic Surface and Tennis Surface Grass at affordable costs. · Diversity: Acrylic multisport surface not only accommodates tennis, buy many other sports at the same time as gymnastics, volleyball, badminton, basketball etc. · Customizability: You can easily modify Tennis Surface Acrylic based on your potential by adjusting the quantity of sand silica combined in the acrylic paint coating. Therefore, your hard court would be compatible with the speed of your playing – fast, medium or slow. When it comes to the synthetic surfaces, acrylic ground is certainly one of the best ingredients used for both outdoor and indoor settings. In the tennis court construction, it is important to use only quality materials as it affects the surface, as well as the play ability of the venue. Hard Court Surface for Sport Facilities. Many individuals are very passionate about games and sports. If you are certainly one of them, you can easily bring your hobby right into your home now. This can be made possible by appointing experts to build surfaces for sports for you. In case you love to play tennis, you can easily put up Tennis Surface Acrylic and enjoy playing your game at any time. You can also invite your friends without facing the hassles of finding hardcourt tennis surface for Sport Facilities of postponing games because of its unavailability. Tennis Acrylic Surface – why should you have one? So, in case your friend has tennis surface acrylic in his/her house, then it is the right time that you have yours too. All you need to do is to contact a professional synthetic Decorative grass garden, Tennis grass, tennis court area, garden lawn, Hard surface, grass for garden specialist and look at their products. The skills of an athlete are developed at a very young age that’s why it is necessary to make sure quality Athletics Tracks for running tracks sandwich system and facilities are in the right place so that youth of your nation can easily compete at the national level. Providing the best and quality Athletics Tracks is the basic need in today’s world. The art of making competitive Athletics Tracks at a low price has been practiced by multiple specialists who usually prepare Complete Running Track for athletes. The surface on which an athlete runs plays an important role in his/her performance. Whether it’s an outdoor or indoor running track, the IAAF Approved Race Track should be durable, flexible, and intended for higher performance training, as well as competition. Several injuries and controversies have already occurred in the past due to poor Athletics Tracks. Many star competitors denied taking part in major events. You may remember the incident where Haile Gebrselassie withdrew himself at the Olympic Games from 5000-meter event which was held in Atlanta. The world champion athlete even refused to take part and the reason was hard running track. To achieve glory, it is quite obvious that athletes always try to run faster, so, it is important to provide them with quality Running Tracks Sandwich System. A hard surface can be helpful for sprinting while the cushioning track is favored for a long-distance run. In recent times, the synthetic running track has been preferred and installed the most in major events. There are several companies that sell such type of synthetic Athletics Tracks in the market. · Fewer injuries and accidents: Asphalt is quite a hard surface to train on and also prolonged training would impact joint health, unconsciousness from falls, result in shin splints etc. All synthetic tracks are user-friendly and some can also be more forgiving. · Safety: It is a simple fact that synthetic tracks are pretty safe for students and athletes whether they fall when exercising or trip on a barrier. There is absolutely no alternative for safety. · Pride and athletics: All users and student-athletes want to get a facility that they prefer to exercise, train on, and use. Additionally, they want it to be striking and they wish to have pride in their community and school. A high-quality, beautiful, bright impermeable synthetic system achieves that.